The cast of the CBC television comedy, Kim's Convenience: Simu Liu, Jean Yoon, Paul Sun-Hyung Lee & Andrea Bang. Vancouver Presents was live with Burnaby-native Andrea Bang, who plays Janet Kim on the CBC television comedy, Kim’s Convenience. 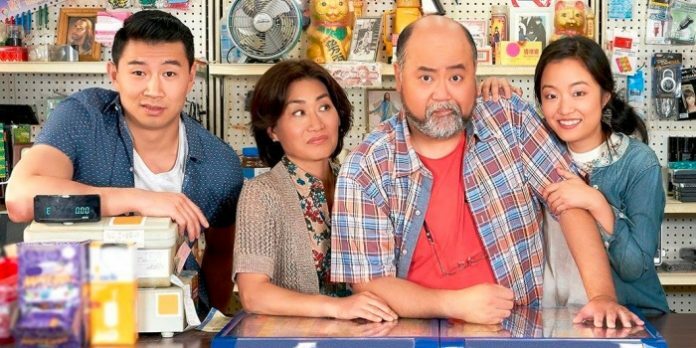 Now about to begin its second 13-episode season, Kim’s Convenience centers on the Korean-Canadian Kim family who run a convenience store in Toronto. Along with Bang, the series stars Paul Sun-Hyung Lee as “Appa” and Jean Yoon as “Umma” (the Korean words for “dad” and “mom”), along with Simu Liu as the family’s estranged son. Kim’s Convenience first saw life as the Ins Choi penned stage play of the same name, a play our reviewer Mark Robins said was ripe for a sitcom treatment back in 2014. Vancouver Presents contributing editor, Mark Robins, spoke with Bang, as she and the cast began their cross-country promotional tour. Video not loading on your mobile or tablet device? You can view it here on Facebook. Live from downtown Vancouver with Andrea Bang who plays Janet Kim on the CBC television comedy Kim’s Convenience. The show’s second season begins on September 26. Check your local listings for channel and time.